My fairly easy going Saturday turned out to be really busy! 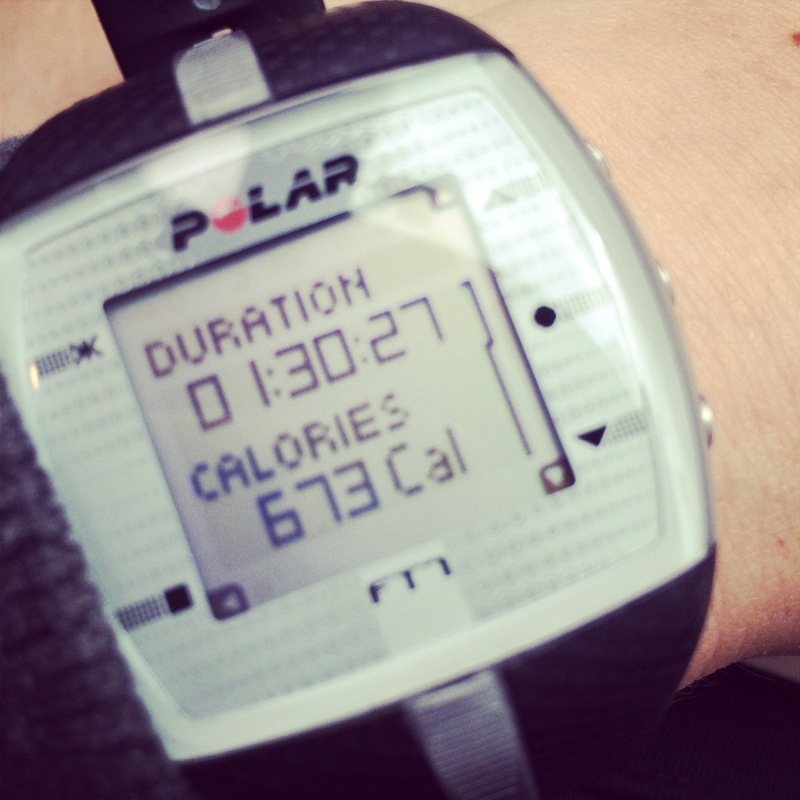 I got up a little early for the gym and got in a great workout. I hit the weights pretty hard–I feel like I’ve been slacking in that department lately what with traveling and training for the 5k. The scales have tipped towards cardio and while I’m still getting strength training in, it’s definitely not enough or as much as I did over the winter. I met up with my friend Erika for lunch at Laughing Planet (I got a beef and black bean bowl) and we hung out there for a few hours chatting and catching up. I ran a few errands, went home and worked in the yard for about an hour talking to Michael about the rehearsal dinner planning and then we decided, why not go out and try one of the places we were thinking about? 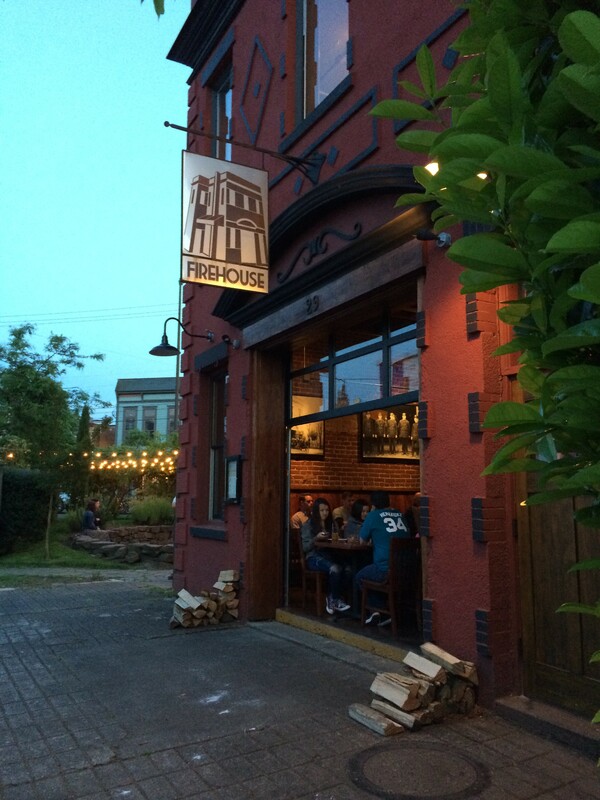 We went to Firehouse Restaurant over in NE Portland. It’s a restaurant I’ve heard a lot about for several years and had wanted to check it out but never really make it to that side of town much. If we go out for dinner in NE Portland it’s usually somewhere on Alberta. Im glad we decided to check out this place. 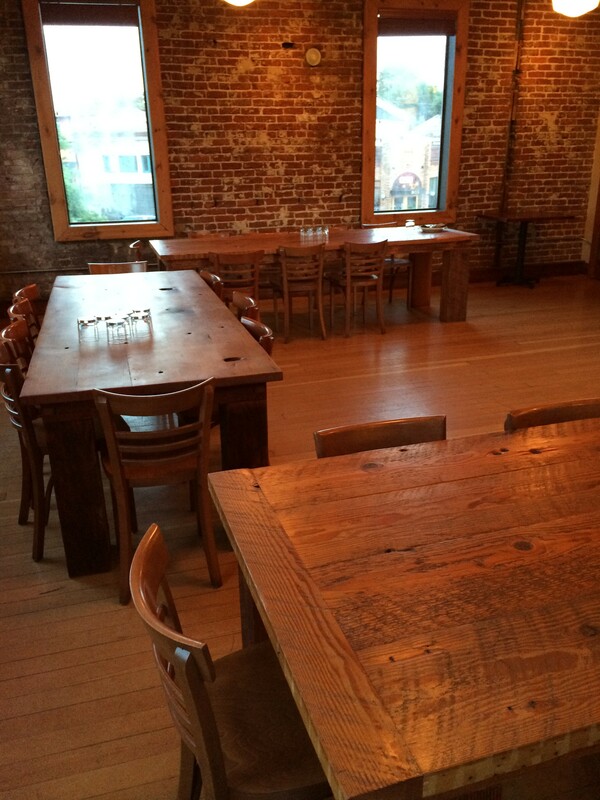 It was such a charming space, built in an old firehouse, and is the front runner for the rehearsal dinner. The building it a two story brick building with a glass garage door that opens up and makes it an open air restaurant. The interior walls were brick and they had charming old black and white photographs of what the building looked like before and the firemen who worked there. There was a humongous brick pizza oven in the corner and while the place looked small and crowded, there was actually a lot of seating available. There was the main area then a back room as well. Before dinner we checked out the space for large parties upstairs. You walk up an old, narrow staircase to the second floor and the area was large. There was a lounge area with a few couches, a bar, and a bathroom. Then there was the main dining room that could fit a lot of people standing for a cocktail hour or about 34 people seated. 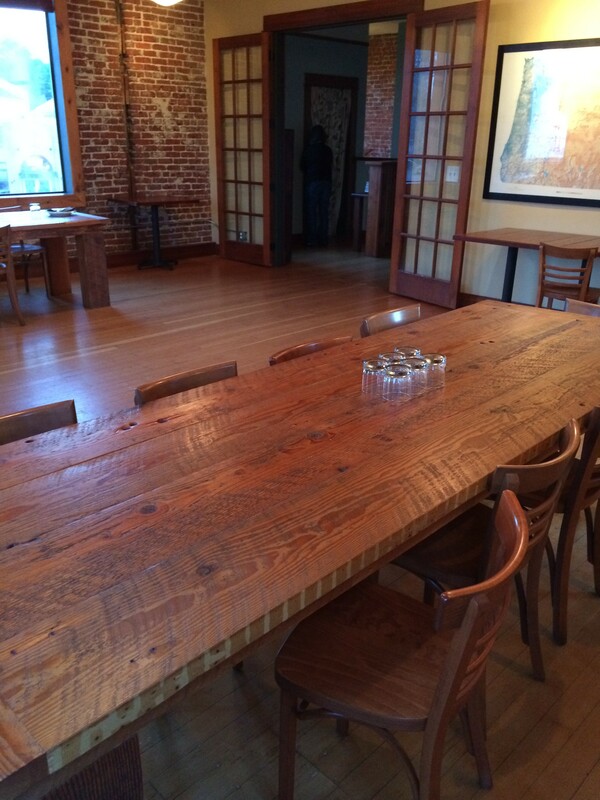 There were three large tables that fit 12 at two and 10 at one. It would be family style dining. The space was really cool and large enough for our rehearsal dinner. I totally fell in love with the space. 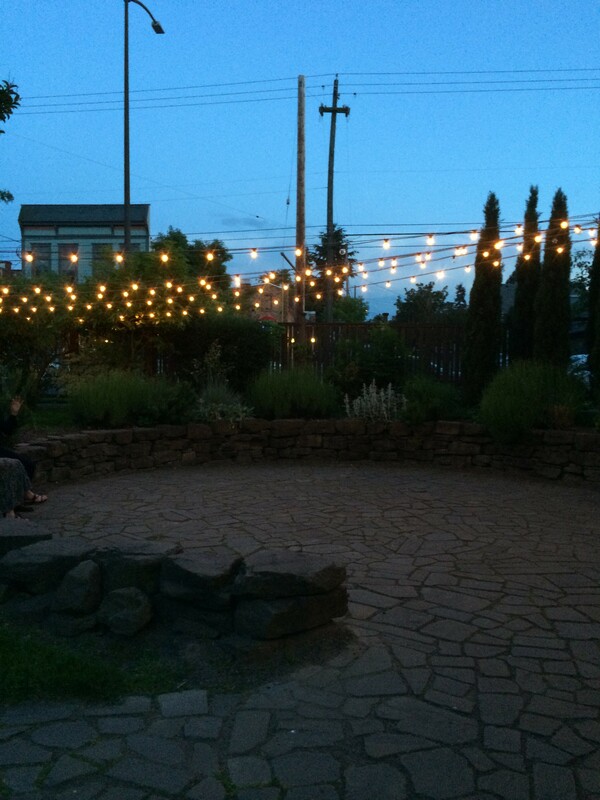 It was very unique and “Portland.” It wasn’t just another banquet room in a restaurant. The exposed brick walls and windows overlooking the yard decorated with Christmas lights was very romantic. Now, time to test the food. 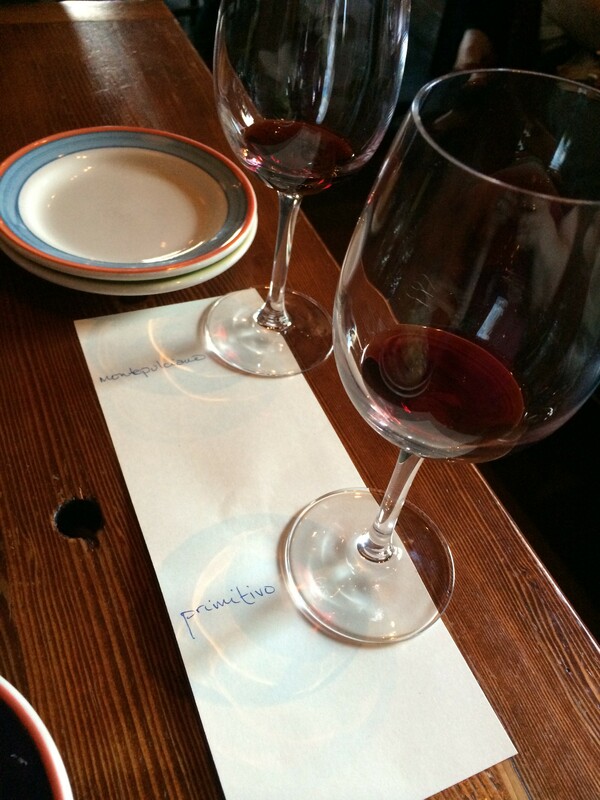 I had a taste of their wine selection and ended up picking the Montepulciano red wine that was really tasty. The Primitivo was way too sweet for me. They had a three course meal option for not very much money. For $29 I could pick an appetizer, salad and entree. I went with that option and Michael did the $25 appetizer, salad, pizza selection. We picked several different things to get a taste of all we could get. 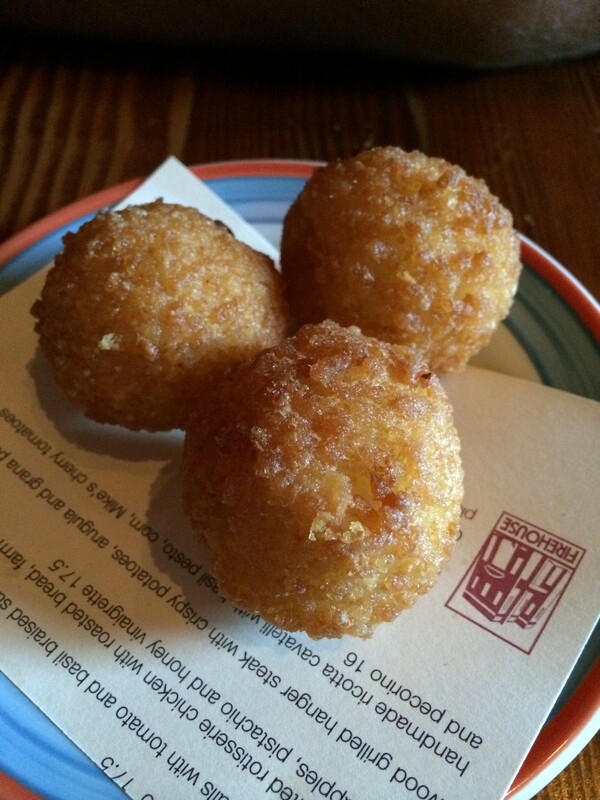 The first was the arancini–fried cheese balls. They were piping hot and crispy and while they were good, they needed a dipping sauce. That would have made them fantastic. The other appetizer was the seasonal bruschetta. It was goat cheese, grilled asparagus in a lemon vinaigrette and shredded cheese on top. It came out on a large hunk of crusty bread. 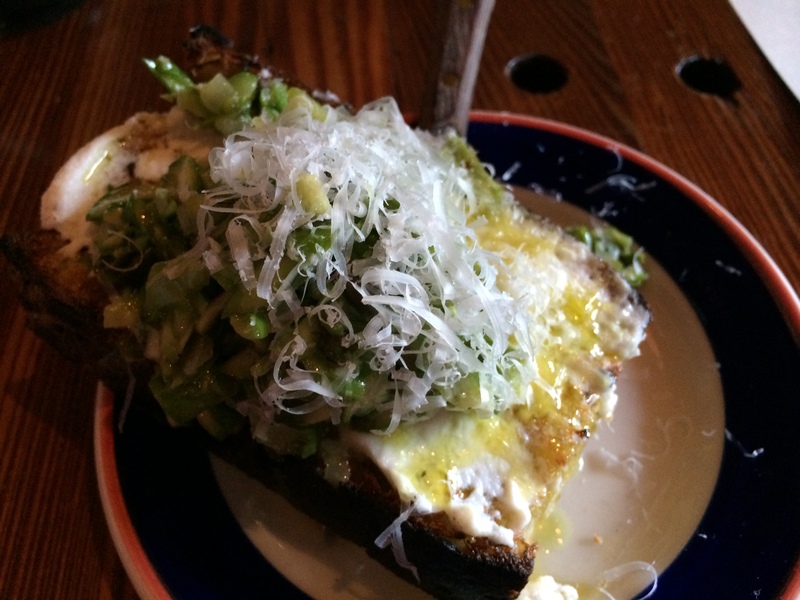 I liked this dish a lot but it would have been better had it been on smaller slices of bread. It was kind of difficult to eat. The flavor was great, though, very unique! 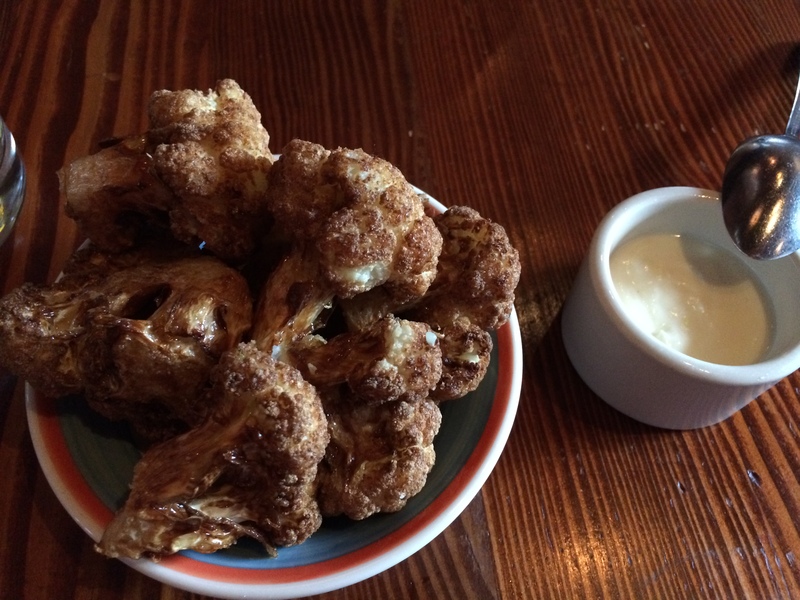 We got a complimentary dish courtesy of the manager–it was the fried cauliflower. Michael remarked that it was like a play on calamari. The dishes were very playful in their interpretations. The fried cauliflower was so fascinating! It wasn’t breaded and it had a crunch to it that was delightful. It came with a lemon dipping sauce that was slightly overpowering. I think a garlic aioli sauce would have been better. The lemon was just the dominant flavor tasted. Still, loved the fried cauliflower! Next up was the salads. 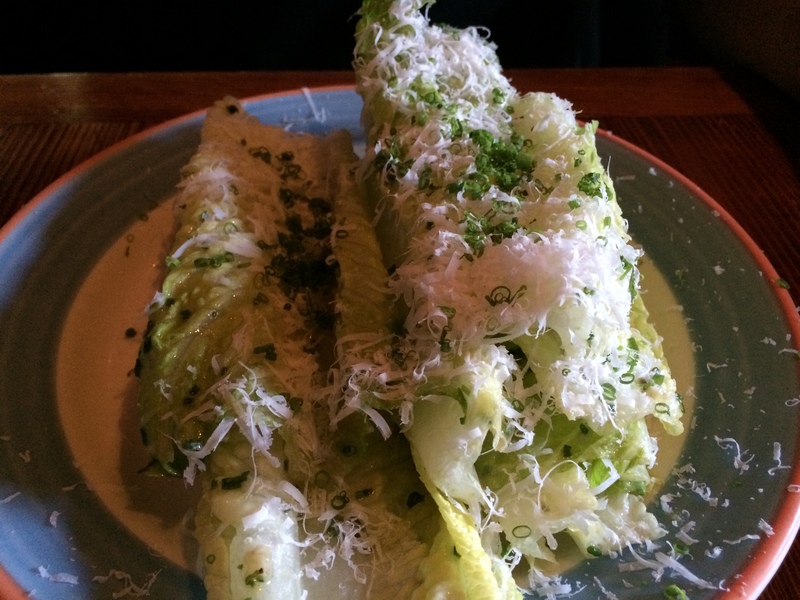 Michael got the romaine hearts which were basically a Caesar salad. It was tasty and had a nice presentation. He thought the salad was a little too salty. I had a few bites and it didn’t seem like it to me, but maybe it was. 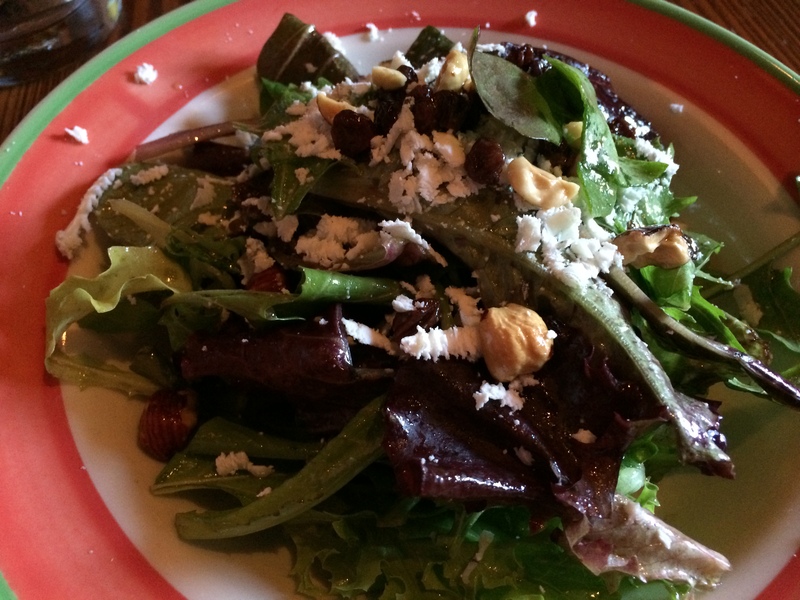 My salad was greens with dried cranberries, toasted hazelnuts and goat cheese. I won the salad competition! Mine was fabulous! By the time our main dishes arrived I was pretty full. I don’t normally eat several courses when we go out to eat dinner. Sometimes we’ll split an appetizer and then get entrees, but rarely do we get all of it! I ordered the meatballs with kale. I’m glad it didn’t come with pasta because that would have been just too much food. 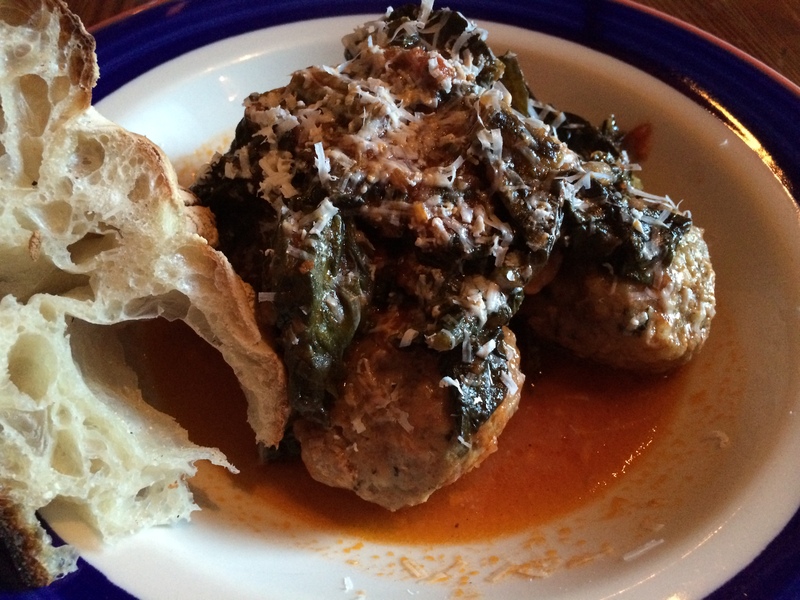 Loved the braised kale and the meatballs were perfectly soft and crispy on the outside. I ate two meatballs and took the rest home for lunch the next day. 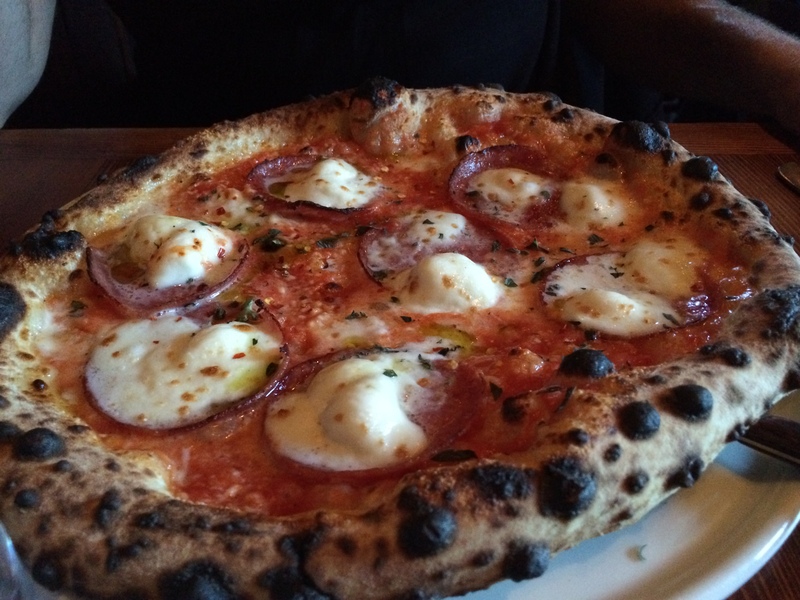 Michael got the Zoe’s Pizza –soprasetta and mozzarella cheese. It was small but big enough for two people to share for a meal. The crust was PERFECT. It was chewy and smoky from the wood burning pizza oven. It was also very, very spicy. Surprisingly so. Michael’s only complaint was that it was a little on the greasy side which made the pizza slightly soggy in the middle. If they could fix that it would be perfect. With everything we had we enjoyed the food and it tasted great. Some of the things I criticize in this post are mild alterations that would make the food absolutely perfect. Just small tweaks it would be magical. Even though we didn’t have room for more food, we wanted to get dessert to give it a try. The manager comped it for us, which was very nice. We ordered the ice cream sandwich. Holy moly! This dessert was AMAZING! The “sandwich” part was on the inside of the ice cream as opposed to the outside. 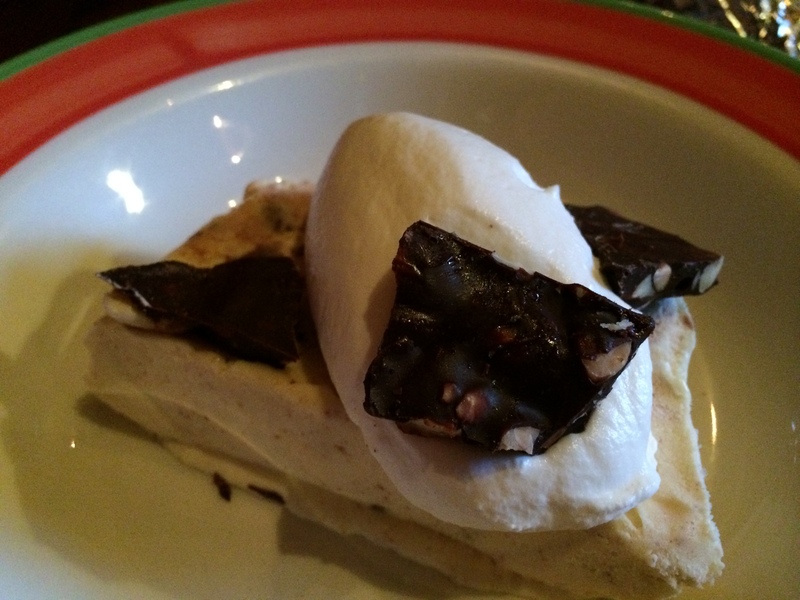 It was topped with whipped cream and dark chocolate almond bark. If this is where we have the rehearsal dinner, that’s the dessert I want. It was so amazing! We left so full and happy with our experience. The “cons” didn’t make us rule this place out. I think everyone would have a wonderful meal here if this is where we had the party. The logistics of everyone getting from our wedding venue in Beaverton to NE Portland are kind of a pain and parking is all street parking but those are minor things. We have one other place to check out but if it were up entirely to me, I’d pick The Firehouse. This is Michael and his dad’s choice though. Time will tell! Wow – that place looks amazing and the price is right. Everything looked SO delicious! I have to tell you I had the most delicious salad at Olympic Provisions on Saturday. I’m sure the Double Mountain Kolsch made it even more delicious after a long day of moving, but it was a romaine with an avocado dressing and hand-boiled egg with fried bread (rustic croutons). It was so amazingly yummy. I can’t wait to go back there! Glad your choices are getting narrowed down. Have fun! I LOVED the atmosphere. It was so intimate and romantic and just plain funky. I’ve wanted to try Olympic Provisions for a long time, too. I need to go there! Your salad sounds fantastic. You really should go to OP. It’s great but kinda in a weird location that you wouldn’t go to unless you were going there. I think we might stay in Beaverton for your wedding. Did you get a room block somewhere? I think Max may stay in Seattle that weekend. Nope, no room blocks but we listed a bunch of hotels on our website. There were a few downtown and then one near Washington Square that would be an easy max/drive to the venue to. But really, watch for Groupons! I see lots of hotel deals for Portland! ok – I’ll turn back on my Groupon alert for PDX. That’s so great! Hotel DeLuxe is one of the places we are considering booking our room. That’s my neighborhood! I love that building and the feel of that space so much. (Apparently in the 90s some guy owned the building – he lived on the 2nd floor and used the main floor as his garage/tinker space. Now THAT is Portland!) I haven’t had their meatballs or that dessert, so I’m glad to hear they were yummy. The fried olive app is breaded (so not good for gluten issues) but SO GOOD. I do love their cauliflower! Haha! Thanks for the offer. It was a very cool building. I could totally see myself living in something funky like that! That is totally my type of restaurant! It was such a cute place! You can’t go wrong with any type of fried cheese ball, IMHO. I am ramping down my strength training now as biking season is starting to ramp up. I can’t keep up heavy lifting with all the biking I do – and I can strength train all winter. I only have a few precious months of biking season! Lori recently posted..Godzilla and biking! I would totally go with your salad based on the pictures. But I would pick Michael’s pizza – that looked delicious!!! Fun trying to pick a place for your rehearsal dinner! My salad is similar to what we are having at the wedding! I haven’t commented for ages, but we got engaged around the same time. My wedding was a month ago and it was amazing. Excited to keep up with your wedding stuff again! Really? Ok well I love talking about it. And I have tonnes of photos if you want to have a look! The wedding was great! It drizzled ALL day (outdoor wedding) so that was stressful. It fined up in time for the ceremony, but started really raining in the middle of it and we all had to run for cover! Nevermind, minor blip! We did photos first which I highly recommend. We got to see each other and calm our nerves, and we got to enjoy the reception. Ceremony was great (even with a quick relocation into the tent) and we loved our celebrant. Reception was awesome – good food, a bit of booze, and a great band!